This RUN comes signed, numbered and with a Certificate of Authenticity from Kukula and 1xRUN. This RUN includes a 2 inch ornate gold frame with UV-glass, foam core backing and ready to hang hardware. "This piece is part of a continuing series that I’m doing where certain themes are painted on the character herself. Every girl has different symbols and designs on her body but no surroundings. She is naked in an empty space telling her story through the images represented on her skin. She’s the canvas in the canvas. Most of the time my work is about things I love and am inspired by. This piece is an homage to stage performance using the classic symbolism found in baroque designs on that theme. For example, Marie Antoinette had theatrical motifs in Versailles. Kukula’s paintings center on feminine, doll-like figures, often surrounded by objects with sometimes clear, sometimes obscure symbolic meaning. The work registers the influences of both classical European art forms and contemporary pop culture. 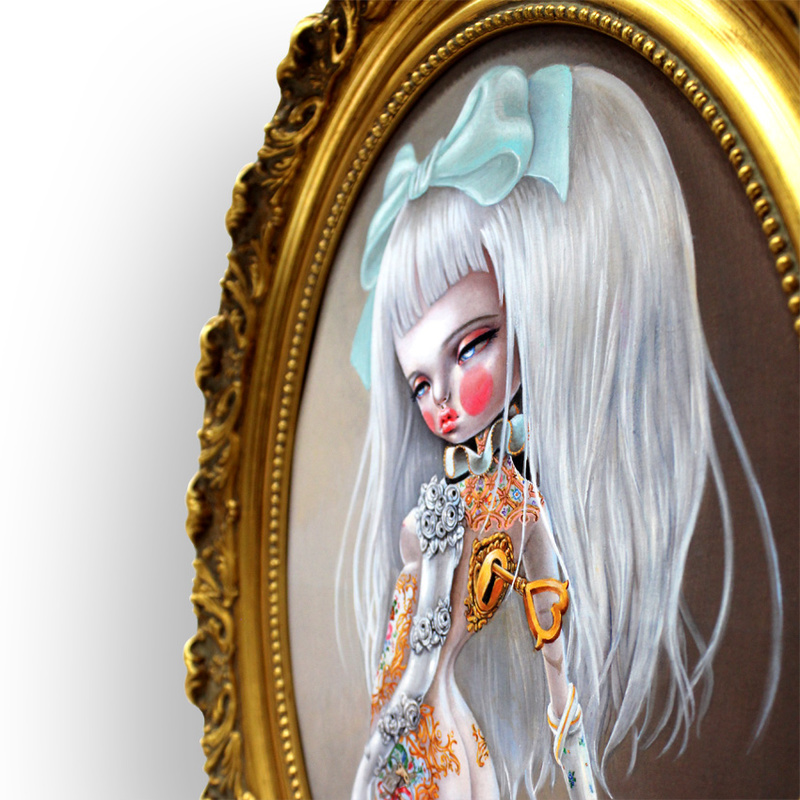 In her figures’ poses Kukula recalls traditional portraiture, yet the style is manifestly modern and pop-influenced. Kukula’s compositions thereby disclose her personal struggles as mediated by a rich multi-cultural heritage.